The fantastic, classical, magic-rich world of Thennla comes alive in Shores of Korantia, The Taskan Empire and more supplements to come. On the continent of Taygus the mighty Taskan Empire expands its rule, pushing back the fractured Korantine city states. The isolated theocracy of the Jekkarenes watches ambivalently while it's queen and priestesses play complex games of political chess. In Assabia sorcerers brood and watch the Taskan expansion with envious eyes, while in the northern lands the tribal Thennalts are prepared to defend what is theirs at all costs. The core supplements of this expanding range are Shores of Korantia and The Taskan Empire. 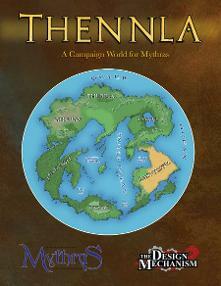 A primer to the world, Thennla, is available as a free download (simply click on its image for your copy). The line expands with scenarios and adventures set across Taygus and detailing the myriad cultures and people of this vibrant, magical, fantasy world. The Thennla Sourcebook is a free introduction to the world described in Shores of Korantia and The Taskan Empire. It describes the major continents, focusing on Taygus, and discusses the Thennlan cultures, empires, religions, magic, gods and the supernatural. Simply click on the cover image to download your free copy. Or, if you'd prefer a print copy, visit our Lulu store. Korantia: a coastal region of the great continent of Taygus, home to dozens of city-states and scores of Goddesses and Gods - each with their own wants, needs, plans and schemes. To the south are the Jekkarenes, the ancient enemy with cause to fear a Korantine revival; in the east the swelling Taskan Empire draws closer to Korantia’s borders with each passing generation; to the north the warlike barbarians of Marangia have fallen quiet since the Taskans seized their capital. To the west is the open sea and beyond are distant lands where colonies were set down in centuries past. Koibos is the 61st Emperor of the Korantines and the 24th of his name. A vigorous young man in the prime of life, ruler of an ancient empire long past its days of glory. It falls to him to restore his realm to greatness or become an irrelevance to the dozens of city states over which he claims sovereignty. 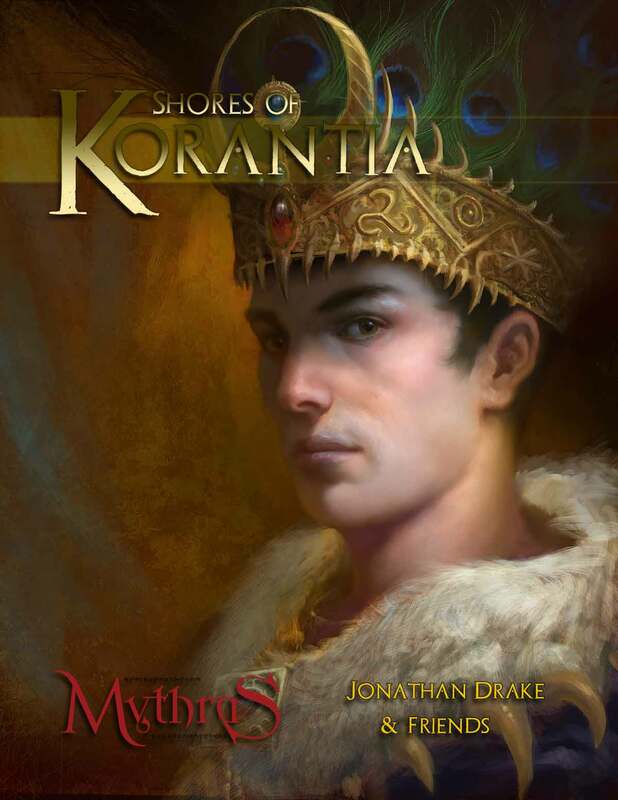 In this book you will find everything you need to adventure in Korantia and beyond; rules for character creation, cults, encounter tables for land and sea, economics, a fully detailed colony in which to start off your adventures, many fully detailed NPCs and a mini-campaign that will plunge your characters into intrigue and plot, culminating in a perilous expedition to a mysterious and dangerous desert island. Ruled by the unseen, immortal emperor through his viceroy, the Iron Simulacrum, the Taskan Empire is the greatest empire in Taygus, eager to conquer new lands and explore further than any empire has done before. 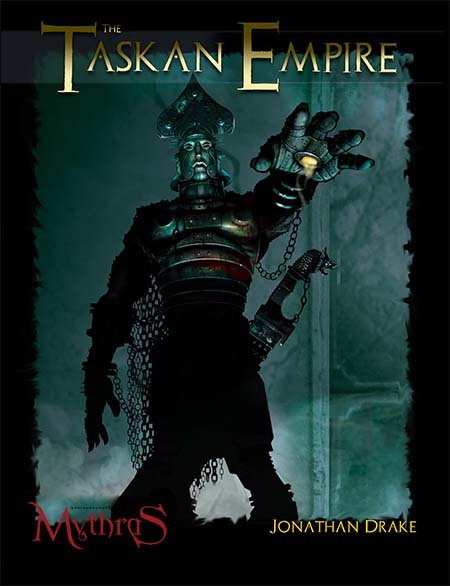 Yet there is treachery in the empire; soon the emperor will ascend to heaven, and so the factions prepare for that day and even the emperor's most loyal followers begin to look to their own loyalties. This companion volume to Shores of Korantia provides everything you need for creating an adventurer of the Taskan Empire. New rules for Taskan skills, magic and divine blessings it expands on the information provided in the Thennla sourcebook. $5.99, PDF, 105 pages. Lulu Print Copy - click here. 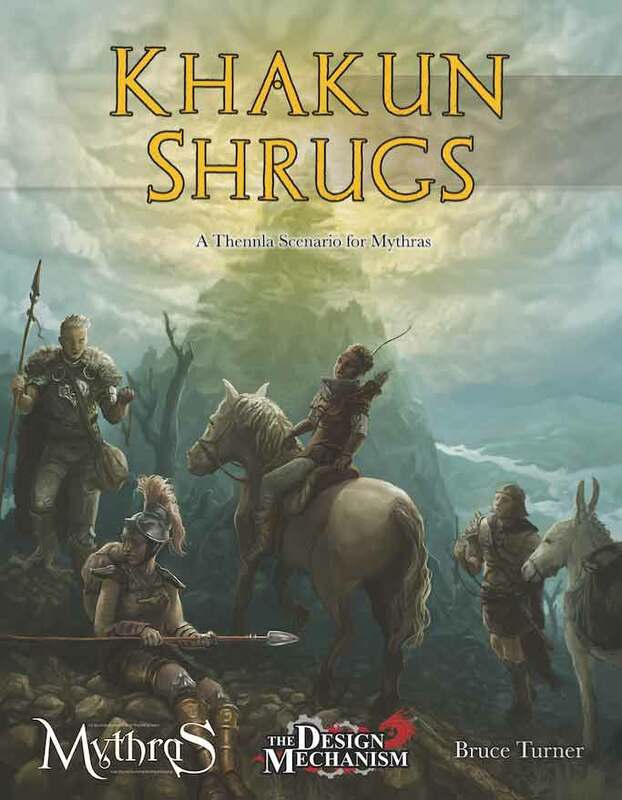 Khakun Shrugs is an epic quest to placate an angered god who threatens the resettlement of Further Tarsennia. Who awoke the slumbering Khakun though; and what will be the cost be to avert his wrath? Join the Tarsen initiates of the Ruddy River Association to find out. $3.99, PDF, 18 pages. Lulu Print Copy - click here. 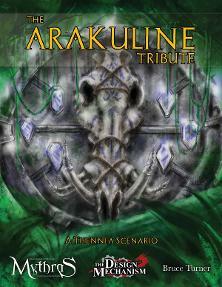 The Arakuline Tribute is a Thennla scenario set in the far north of the Taskan Empire, where the Thennalt tribes hold sway. The characters are persuaded to investigate the stronghold of an outlaw gang that may have seized the famed tribute of the Arakuline tribe decades before, and must navigate the hazards of the dense forests to locate the hideout of a strange cult.